If you have four kids in the UK, you need to buy a People Carrier and make sure it has special isofix child car seat fittings. 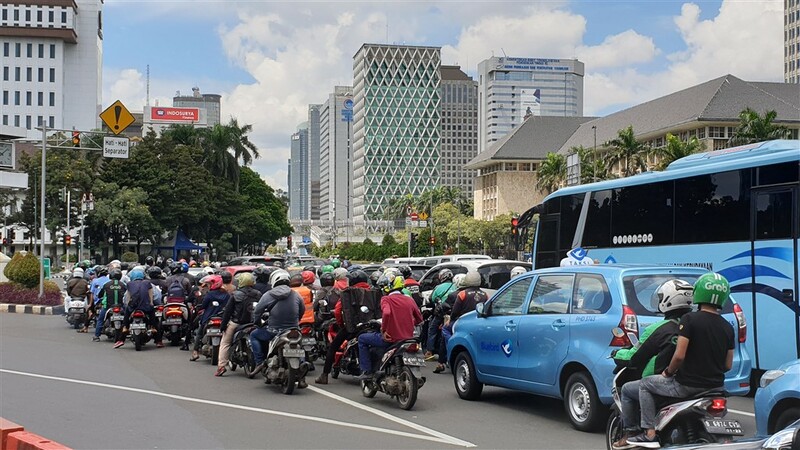 In Indonesia you just get two scooters. From Jakarta we caught a train to Bandung and went in search of this location as I wanted to feature the postcard on my other blog – Postcards for Petrolheads. We found the location and by chance an old Volkswagen microbus went past just as I took the picture. When I got back to England I was searching for another postcard of Bandung and found this. What a coincidence! From Bandung we went to Jogjakarta. The traffic wasn’t as bad as Jakarta but was still pretty hectic. Here we can see one of the ways it’s all kept moving. North of Jogjakarta is the Merapi volcano. We hired this Jeep and its driver to explore the area. It was a Willys Jeep but sounded like a diesel. I asked the driver to show me the engine. Isuzu! We didn’t have a common language but I think he said the suspension was Toyota. A real work horse. There’s a large,modern, educational museum on Merapi that tells you all about volcanoes but there’s also a little museum in a village devastated by the 2010 eruption that can only be reached by Jeep. This museum shows not why volcanoes erupt, but what happens when they do. There were quite a few motorbikes like this on display. Back in town we went to the Sultan’s Palace and found these two fine examples of Detroit metal. On the left a 7 litre 1964 Cadillac Fleetwood 75 and on the right a 1964 Ford Galaxy. In Jogjakarta there’s a motor museum the likes of which I’ve never seen before. It’s called Merpati and it’s a private collection of bicycles, motorcycles and cars. Oh and sunglasses and radios and model cars. And other things too. I think it’s a compulsion. The exhibits are all closely packed, but there are some real gems to be found. I was the only visitor and had my own guide. Here are a few of things that caught my eye. A Suzuki “Kettle” – water cooled triple GT750. One from my era, when I had my Kawaski 500 Triple. The smallest carburettor I’ve ever seen. This is an inline four cylinder, shaft drive Nimbus from Copenhagen. They had some very cool cars in the collection too. A lovely Fiat 1500 Spider. A Mitsubishi Colt Galant GTO. One of the first of the Fast & the Furious. A two cylinder, air-cooled 800cc Toyota Sports. This one was an automatic. There were lots more interesting cars but this isn’t a catalogue! Here’s a YouTube video about the museum if you’re interested. It’s in Indonesian. Jogjakarta Motor Museum. From Jogjakarta we drove south to the coast. The beaches go on for miles but there were three mobile photo labs all parked together. Odd. Indonesians are obsessed with taking photos on their phones (as are we all I guess) so it seemed strange that these guys could make a business out of printing a photo there and then. Anyway, on the left we have a converted scooter and on the right a converted quad bike. But this was my favourite. I just love the vertical steering column. Straight out of Wacky Racers. And to finish off I’ll leave you with this splash of colour, which sums up the vibrancy and humour of Jogjakarta. Great fun! Hi – looks like an interesting visit – was it something special or just a place you wanted to visit?